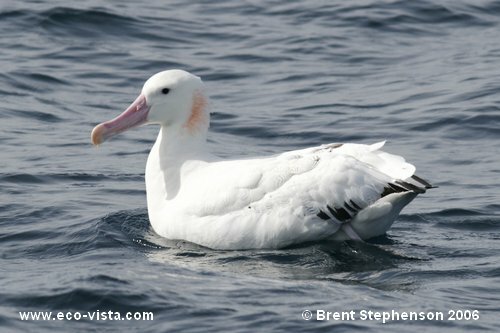 During a pelagic trip off Gisborne on 19 August 2006, we encountered relatively large numbers of Wandering albatross (see trip report here). Most of the birds fitted with what I would have expected for Gibson’s birds, although there were several which fitted the bill for Antipodean. In general the birds seen that day were quite pale generally, appearing to be older birds. However, at least one bird in particular was extremely pale, showing only a limited number of dark feathers on the folded wing, and it appeared larger than the other attending birds. This bird also showed the waxy ear marking of a breeding bird, so I’m not sure if this would fit with a Snowy, at this time of the year, and in this location. I’d be very interested to hear from people with regards to their thoughts on this bird in particular, and I have included another photo of a quite pale bird which seemed to fit more with a very pale Gibson’s with regards to size. 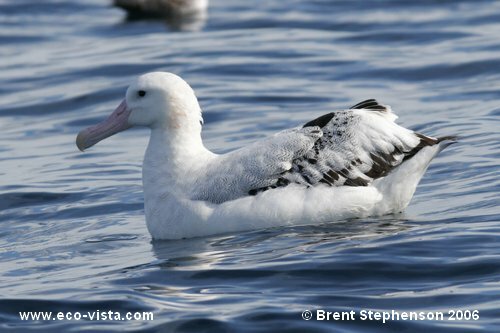 Very pale Wandering albatross (left), could this be a Snowy?, and a pale probable Gibson’s (right). The above photographs are copyrighted. If you would like to use any of them, then please contact me first. Reproduction in any form without consent is not permitted.